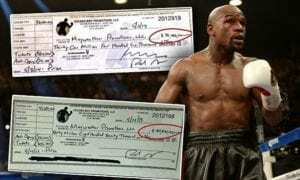 A new report has revealed the net worth of undefeated former boxing champion, Floyd Mayweather. Retired boxer, Floyd Mayweather Jr is widely considered as one of the greatest boxers of all time. He made his money by fighting in the ring. He retired undefeated 50-0 professional record. Mayweather who was born on February 24, 1977 in Grand Rapids, Michigan is also considered to be one of the richest men to grace the sports. According to Celebrity Net Worth, Floyd Mayweather’s net worth is $560 million (£404.6m). He’s earned up to a whopping $300 million (£216.7m) per fight. His total career earnings are estimated to be a massive $1.1 billion (£790m). Floyd Mayweather’s net worth is almost entirely the result of his phenomenal success in the boxing ring. including $250 million in his fight against Manny Pacquiao in May 2015 and a staggering $300 million for his fight against Connor McGregor in August 2017. Apart from boxing, Mayweather has earned about $25 million from small endorsement deals and merchandise sales. He also briefly appeared in the WWE in 2008.